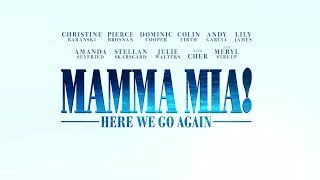 Mamma Mia: Here We Go Again! Movie Get ready to sing and dance, laugh and love all over again. Unfriended: Dark Web Mamma Mia: Here We Go Again! A return to the magical Greek island of Kalokairi in an all-new original musical based on the songs of ABBA. 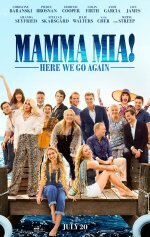 Mamma Mia: Here We Go Again! release date was Friday, July 20, 2018. This was a Nationwide in theaters release. Sequel to the 2008 hit Mamma Mia. The original starred Meryl Streep, Amanda Seyfried, Pierce Brosnan, Colin Firth, Stellan Skarsgård, Julie Walters and Christine Baranski. 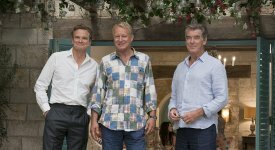 Firth, and Pierce Brosnan characters years before the original takes place (5/19/17). Universal says the original cast is expected to return with some new faces too (Deadline.com, 5/19/17). The location will again be the Greek island of Kalokairi (Deadline.com, 5/19/17). 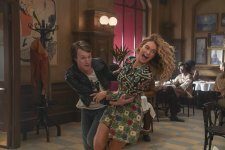 The film will include ABBA songs not featured in the first film along with some reprised favorites (Hollywood Reporter, 7/12/17).